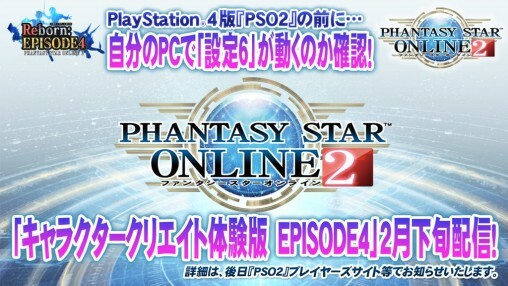 The phrase must be said at some point in time, as long as it is done before maintenance on January 27th. Items will be distributed at a later date. 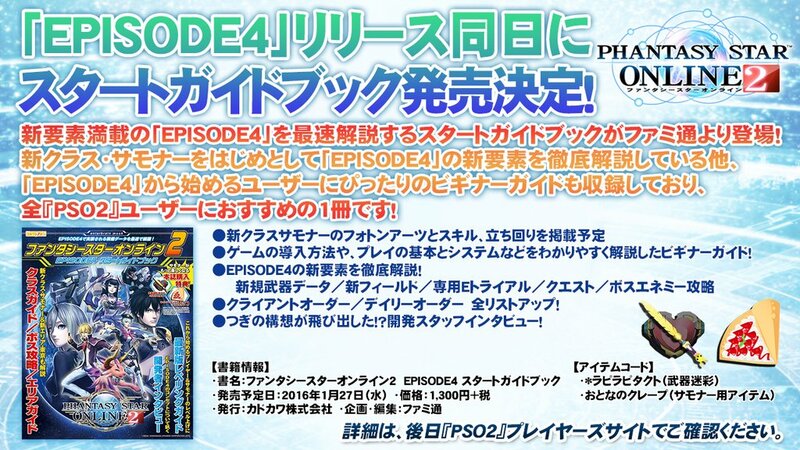 Previous information about Episode 4 can be found here, here, and here. A New Class “Summoner” fighting with Pets they’ve raised. A Character Creator that goes above and beyond. 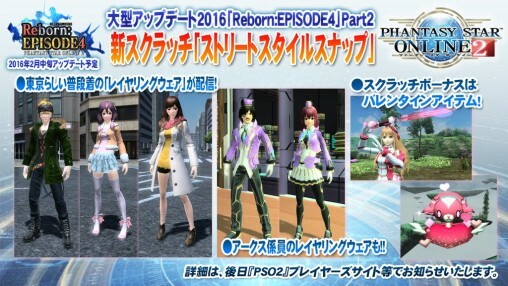 Experience the new Layered Wear Costumes. Item Pack can be expanded to 150 slots with AC. Free 300 slot Character Based Storage! With AC it can be expanded to 1000 slots. Premium Storage expanded to 400 slots. Save up to 12 My Set slots. Maximum of 5 Support Partners. Defeat the special prefix-named Diabo appearing in this quest and obtain new special abilities. Use it to earn a success rate bonus when combining Ⅲ’s into Ⅳ. Special Prefix Named Diabo drops Nemesis Weapons. ARKS Attendant Layered Wear costumes. 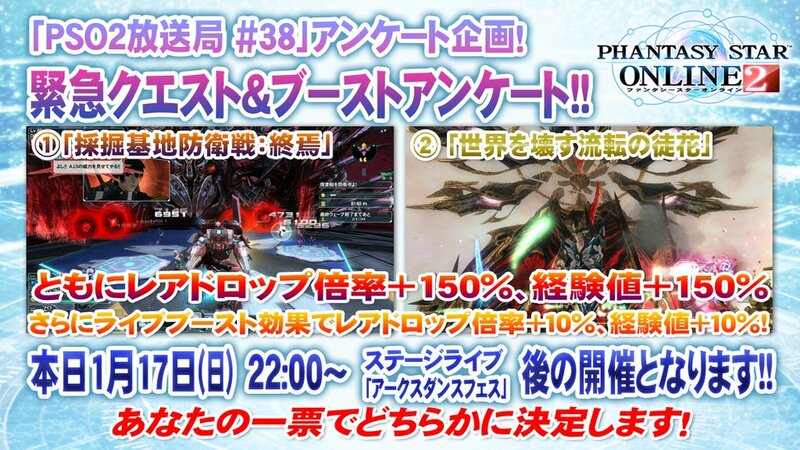 The bonus for this scratch will be Valentine Items shown on the right. 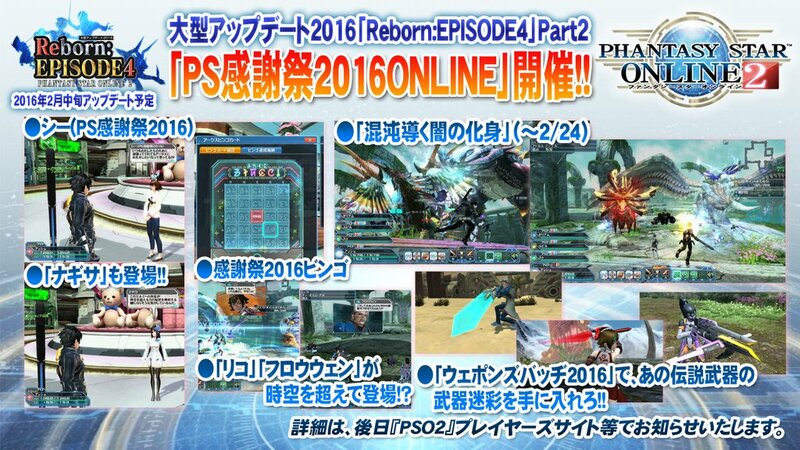 PS Festa 2016 ONLINE Event! An All Star Quest taking place in Floating Facility. Rico and Flowen crossing over Space and Time. Earn quest points to increase the chances of bosses and Rare E-trials. 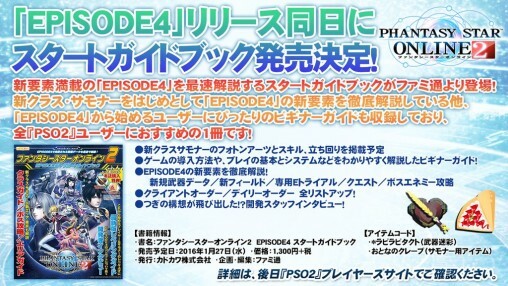 Flowen’s Sword, Red Saber, Dual Bird, Amore Rose, Galatine etc..
A Start Guide explaining the new features of Episode 4. 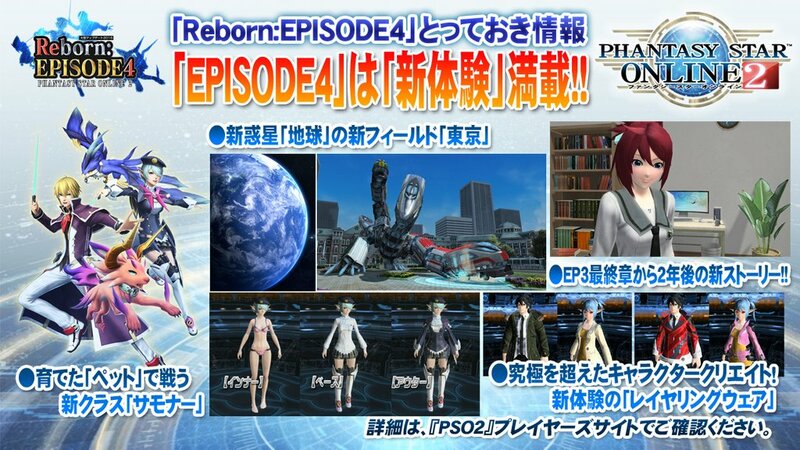 Releases the same day as Episode 4. The Charagumin [Fonewearl] is now on sale! 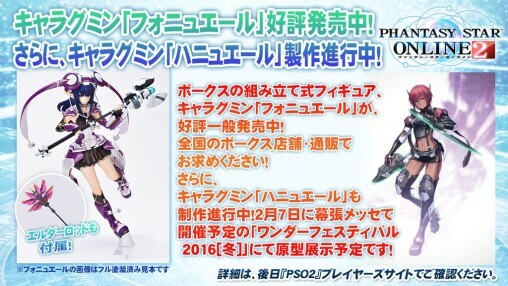 However, today we’ll be announcing a new Charagumin Figure. The prototype for the Charagumin Hunewearl will be revealed at the winter [Wonder Festival 2016]! Itsuki and Rina’s Hair and Voice. 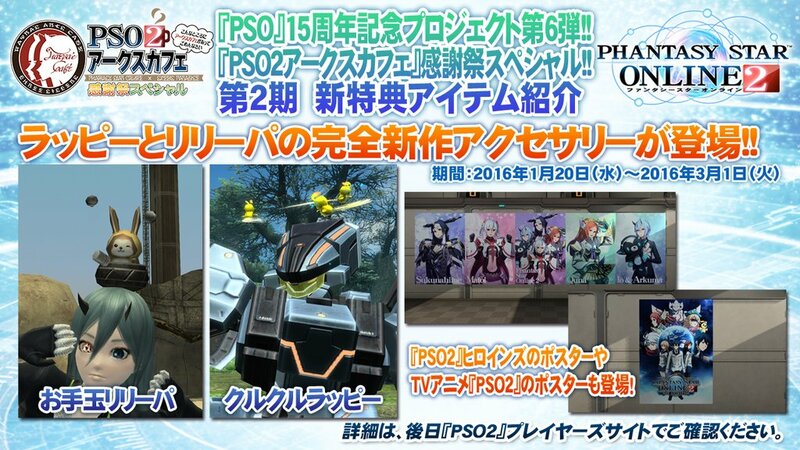 PSO2 Anime Eyebrows, Eyelashes, and Eyes. Seiga Academy Ribbon and Tights. 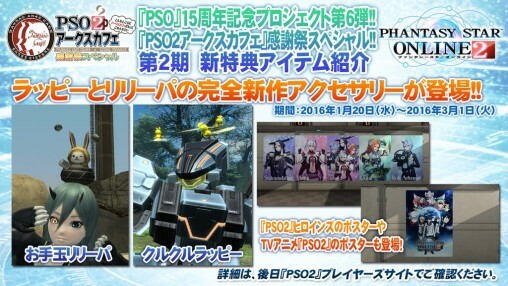 PSO2 Heroine Posters and PSO2 TV Anime Poster. 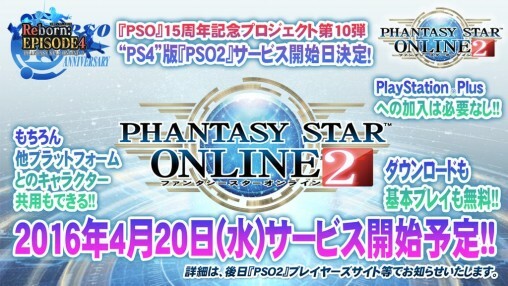 You can sign up at the PlayStation Store, from either the web or your PlayStation 4. Some time after the application period is over, they will select the winners and send them a product code for the beta. As a bonus for participating in the closed beta, you will receive the following items based on your character’s class level. Only 50,000 people will be selected for the Closed Beta Test. The exact times for the schedule will be revealed in the future. Don’t expect it to be a complete 24 hour test. The PS4 version plans to launch on April 20th, 2016! 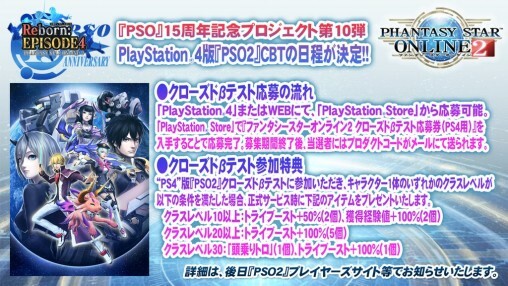 PlayStation Plus subscription not required to play. 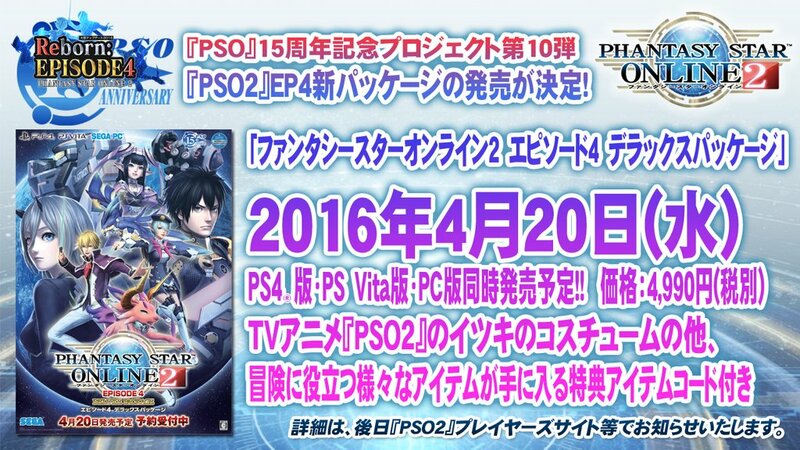 PSO2 Episode 4 Deluxe Package releases April 20th. 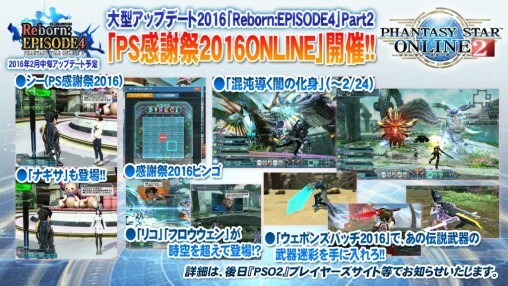 The Deluxe Package will have a simultaneous release on PS4, Vita, and PC. You can get item codes for Itsuki costumes and more. 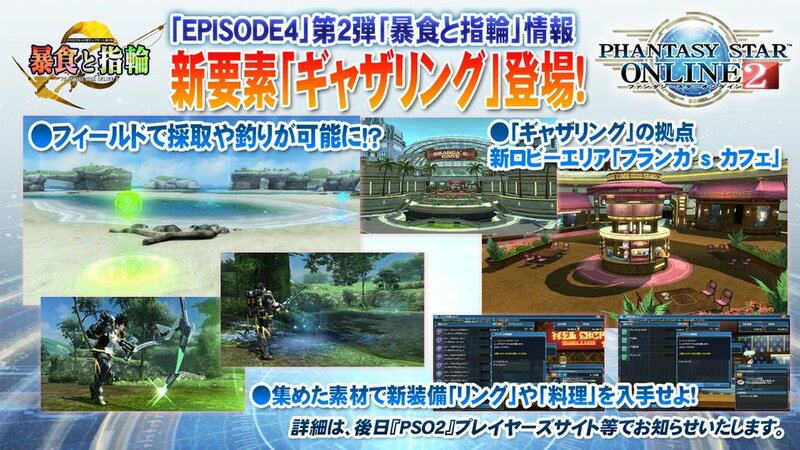 This March you’ll get to fish and harvest from the field. A new area called “Franca’s Cafe” will be added to the lobby! Obtain new “Rings” or create some “Cuisine” by gathering materials. You can equip a ring to your right hand and left hand. Some rings require Lambda Grinders in addition to specific materials. Rings will also raise your stats. You can create Cuisine by gathering specific materials. Effect: +30% Vegetable Acquisition Rate for 1 minute. Effect: +50 HP + 5 PP for 5 minutes. 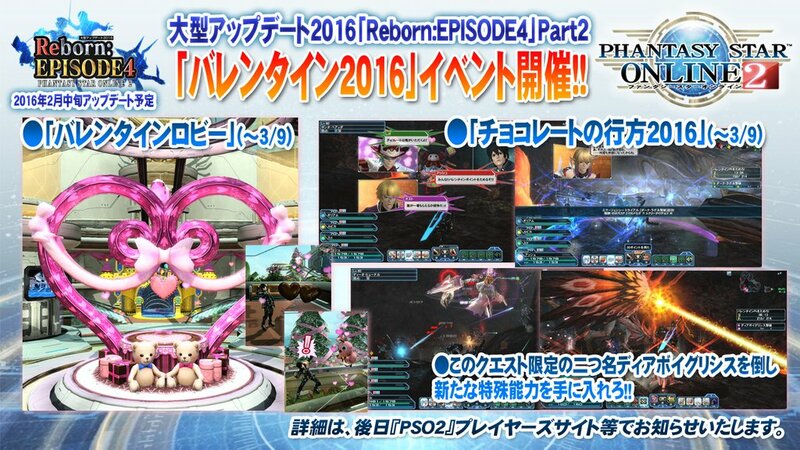 I kinda wish ARKS Grand Prix competitions didn’t boil down to “Braver vs. Braver” team races. It’s great that a new addition is functionally great, but it shouldn’t be so good as to literally be the best class in the game. FoTe would like a word with you. Let me rephrase that. “Dominate the metagame” describes it better. FoTe *still* wants a word with you. Speaking of which, thanks for reminding me! I sorta strayed away from FO/TE for a while to fiddle with other classes, and I forgot how awesome it is. I think I wanted to try something new cause it felt slow, but it’s still pretty fun after a break. Also, what I mean is, if you watch the competitions, pretty much everyone picks BR. If you didn’t pick BR, you probably picked RA. If you didn’t pick either, you were generally on the losing team. I’m not saying FO/TE is by any means weaker than BR, I’m just complaining that GP really, really likes BR. I suppose that content is favourable for those classes or smth? But GP meta =/= game meta. Well, BR’s PAs are easy to land and has good hit&run damage without much effort. Other classes can do higher dps though(on slow/big target), but have harder time landing full damage, heck, I’ve seen people doing total 7 digits per PA with Hu weapons but they’re slow, easy to miss the target, and require specific conditions to get full damage. The game actually boiled down to “fast and high enough damage to kill not ‘overkill’ ” imo. Think about it this way. Darkers are still out and about. What safer way to get food and materials than to have ARKS do it? Besides, even if you don’t eat it, civilians will do it anyway. That’s a job well done, in all aspects. So it’s not a budget cut at all. Yeah, that’ll keep several large cities’ worth of people fed. That sarcasm doesn’t quite fly, you see. Each ARKS ship has agriculture and marine areas. The latter of which you can see at the southern end of Shop Area, and the former of which was pointed out by Matoi during Episode 1. The civlians can be fed by the ecosystem sustained inside the ships. While I suppose there’s a degree of BS to be called out on for making ARKS work for their own food, getting outside sources of good would be a good exercise at the very least. Knowing Franca, she lets us work all the time for our own benefits. The most convenient context for these activities is probably that player, unlike civilians, freely explores planets. So if you manage to find stuff around there, you might as well request something to be made out of them for yourself. It kinda fits in the whole Arks activity, and might be executed nicely, you could place rare gathering spots in boss areas, parallels or even abductions. Anyone else not getting item translations? I haven’t had that work for a few days now. Try forcing a plugin check? didn’t know it was a plugin for item translation, thank you. 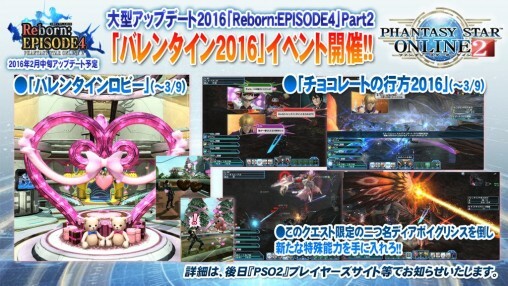 I didn’t realize how much I needed fishing in PSO2 until this very moment. Thank you, SEGA. Hey me too. I can’t wait to be called “Kid ripoff #410” when I’ve been using almost all of that outfit for years. …y’know. people crack wise on ye olde sum’ner not having JA timing with pets, but… logically speaking, isn’t it a bit hard to carefully apply your own timing to going “SIC ‘EM!” at an attack dog, as opposed to swinging a weapon yourself? 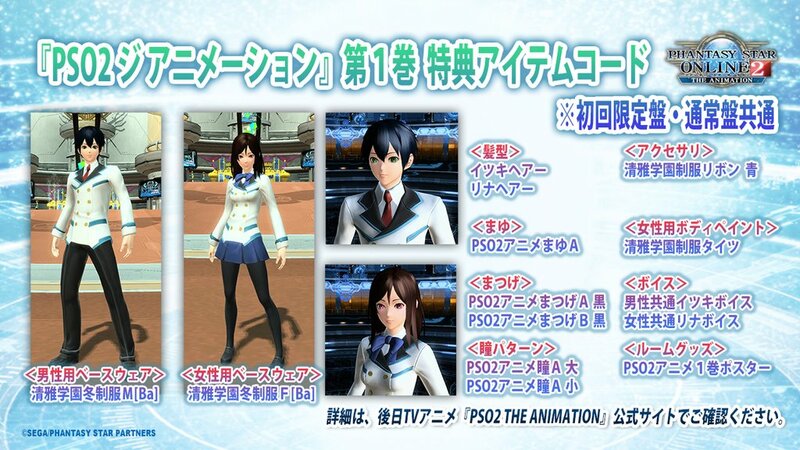 which is something the talking heads sega had being interviewed for magazines should have considered pointing out, instead of trying to suggest a class with it’s own unique mechanics, costs, and complications that have no bearing on other classes at all to be a “beginner class”. He was the muscular guy who wore a green shirt and tan pants. He had a somewhat wild hairstyle that’s short. He wondered near Zeno I believe. Henri was one of the NPCs removed from the Shop Area when Episode 3 launched. I still don’t remember him clearly but I have an idea, thanks. This game just keeps getting better and better. 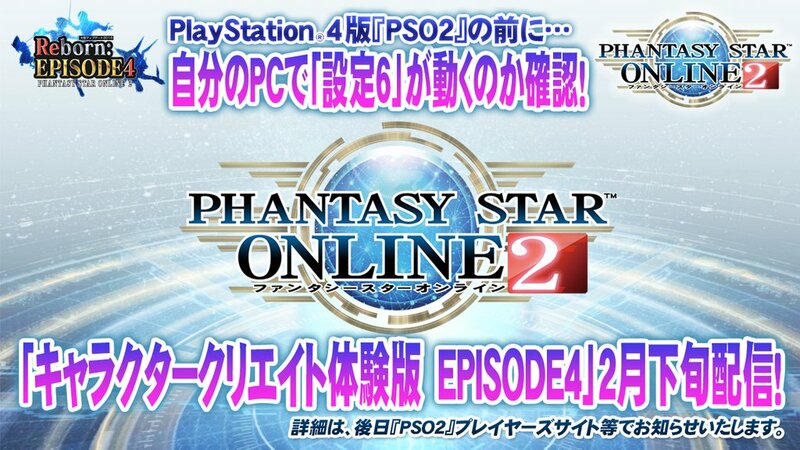 UNSTOPPABLE Pso2. Oh I get it, dry sarcasm. Witty. you need a JP account. if you don’t have a JP account, you won’t be able to play. If existing games are any indication, you’ll be able to play it regardless of what region your account is from as long as your PS4 has a Japanese account that has downloaded the game. Just be aware it will be in Japanese with no hope of a language patch. I wonder if the package version let’s us play using the US account. So any certain way to solve NP1013 gameguard error? Troubleshoot didn’t work and I don’t have any extra programs open. I guess it’s something I’ll have to hope on AIDA to fix. There is a way around it using a batch file. 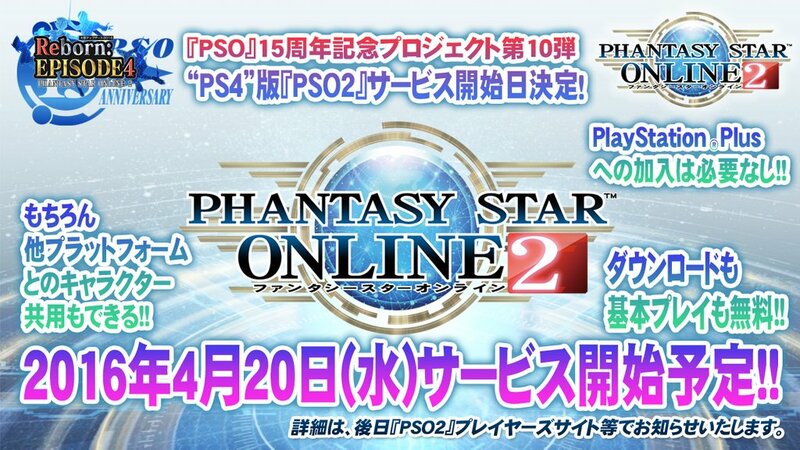 You can find more details on the PSO-World forums. Not really, didn’t they move the old FFXIV to separate servers or something? Pretty sure you can still use ship to for all four episodes.